QuickTime has a neat little trick that some may not know about, it can record your screen. Use it to record a how-to video how to navigate System Preferences, or how to use Final Cut Pro, or record a MacDevOps:YVR talk. The first two MacDevOps:YVR conferences needed to be converted to a suitable format for YouTube and using QuickTime screen recording + Soundflower is the way I chose to do it. Note: Soundflower is needed to redirect the audio to QuickTime. Screenrecording with QuickTime does not capture the audio without Soundflower. I own Rogue Amoeba’s excellent Audio Hijack application and have used this app for audio capture (podcast interviews, etc), but I couldn’t get it to work in this case. It might have also required their Rogue Amoeba’s Loopback app which I did not own. Since I’ve used Soundflower previously I used it here in this case. Move over El Capitan, hello Yosemite! With all this talk about El Capitan, Apple’s as of yet unreleased version 10.11 of OS X, and its wondrous new features in Xsan, I think it might be time to upgrade to last year’s breakthrough version of OS X, Yosemite. Sure, you might be excited by the press releases for the built-in DLC in El Capitan but seriously sane folks stay 1-year behind the bleeding nose upgrades provided by Apple. So if OS X 10.11 is all the rage before its released it must be time to seriously consider upgrading that working Xsan running OS X 10.8 or OS X 10.9. In my case, I upgraded a working Xsan running on Mac Minis and OS X 10.8.5. Here are some screenshots from the process. As always think worked better than I could have expected, and it is a much easier process that one expects. But stay sharp kids, danger lurks when you wake the dreamer…. Upgrading a SAN is serious business and doing anything like this without proper backups is taking your life in your own hands. In my case, full disk backups on Promise Pegasus RAIDs and full tape backups using Archiware P5. Download the Yosemite installer form the App Store. Install. Download the new Server.app from the App Store. Install. Now upgrade your Xsan. That’s it. You’re done. No surprises, aren’t you happy? Ha ha. I’m kidding. The fun is just getting started. If you’re actually following along, this isn’t a step by step recipe. Go to Apple’s site and read this Kbase and check out the migration guide. Step 1 is to launch the new Server.app, find Xsan Admin. Just kidding, it isn’t there. 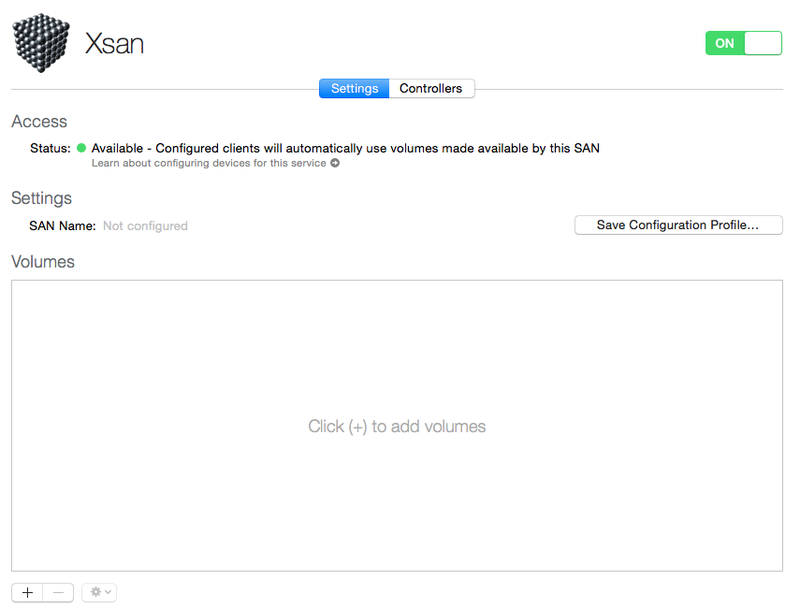 Enable Xsan, and choose to Restore a previous SAN configuration. That wasn’t hard. High five! Actually, we’re not done yet. Set up OD now. Go! Step 2. Set up your Xsan controller as an Open Directory (OD) master. Does’t matter if it’s joined to another domain, Xsan keeps itself organized in OD, so you need it. Step 4. Where did my Xsan admin go? Where do I add clients? Where are my clients? Huh? What? Why did I upgrade a perfectly working SAN to this version? Ha ha. Click on the “Save configuration profile” button and download the profile somewhere. Use this to set up the SAN on your clients. Distribute via Profile Manager or install it manually. Up to you. I haven’t gotten it to work with Munki quite yet. 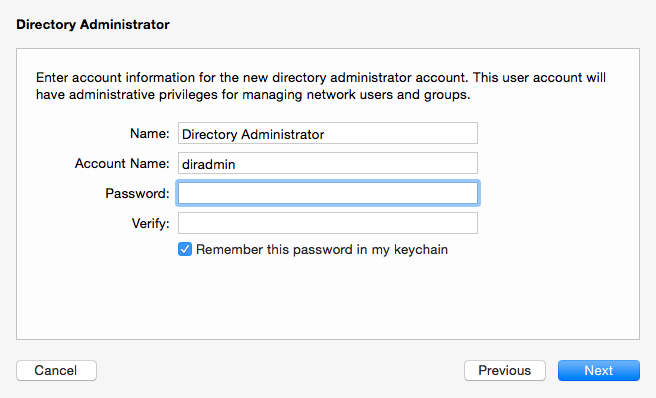 Installing it requires the admin password for the Xsan controller. How convenient. Step 5. Set up a backup Xsan controller. You have one of those, right? In my case, I had a client which I wanted to promote to be a controller. But first what to do about its status a client of the Xsan? 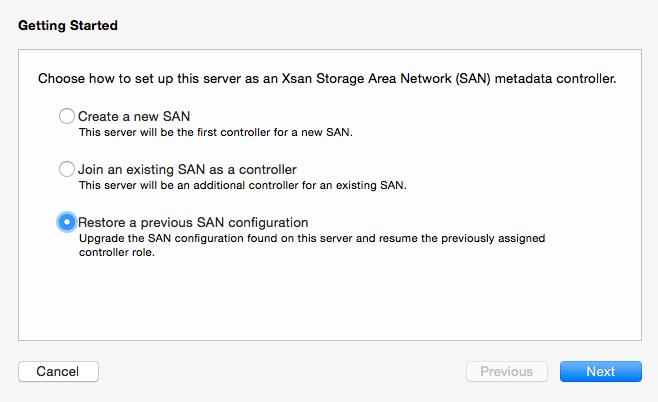 Open Server.app, enable Xsan, join current Xsan as a backup controller and set up a replica OD. Confirm, confirm, confirm. Think about what you’re doing, then do it! Apple wizards are the best wizards, uh, i mean Setup Assistants. No wizards here…. So, you’ve setup a backup Xsan controller, and OD replica, and now look in Server.app. How amazing is that… wait, what? Where’d my Xsan volumes go? Huh? Where are the controllers? Weird. Very strange. Not comforting at all. The Xsan window eventually shows the volumes and controllers, bur geez, almost gave me a heart attack. It’s not like I never seen Xsan go bad before. Xsan 1 nightmare still haunt me. They do. Backups. Need more backups. Archiware P5 Backups, do it now! OK, you’ve survived the uncertainty of Xsan upgrades…. But wait more minute… cat the fsnameservers (no, it’s not the name of a band, it’s a command). Check it out. Holy smokes, batman. Xsan 4 by default will set your metatadata network to the public LAN, something that’d would be laughed at years ago, but they do it now by default. Of course, upgrading our SAN kept out metadata network the same. But strangely the Xsan backup controller is set to use the public for metadata when the primary controller is not. WTF. Change your metadata network. Read the Kbase, and once again wield xsanctl like a boss.